View More In Fish Bowls. There is a special reservoir beneath the rocks that captures the waste as it works its way to the bottom, keeping the water crystal clear. Before pouring water into the tank, place a collection glass below the spout to allow the dirty water to flush itself out into the glass. Cleaning automatically stops when the water reaches the perfect level. It is so easy kids can do it! It is the perfect gift for all ages. This aquarium is easy to display anywhere and it will liven up any space. Then the Fun Self Cleaning Fish Tank is exactly what you need! You will no longer have to stress about wasting electricity on noisy aquariums or having to deal with high running costs and constant maintenance. This Fun Self Cleaning Fish Tank requires no cords, no messes, no replacement filters, no chasing fish with a net, no removing rocks or plants and no gravel vacuuming. In order to clean this desktop aquarium, all you have to do is simply pour a glass of water into the tank and in less than 60 seconds the aquarium has cleaned itself! 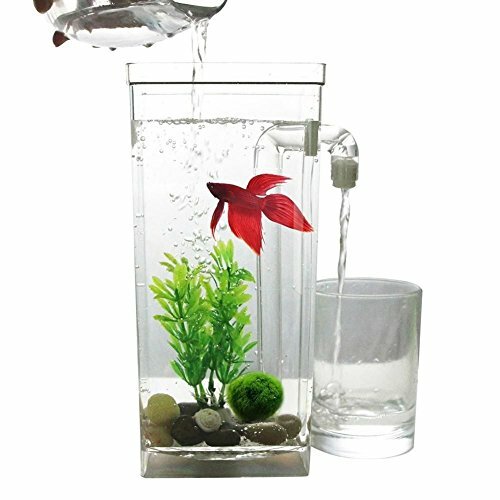 By simply pouring clean water into your desktop aquarium you can keep your tank clean and your betta fish safe from harm.